Nachos are an excellent way to use up leftovers in your fridge. Really, just about anything goes. A few weeks back Lentil Tacos were on our meal plan. They were really, really good. The twins (5) helped me prepare them. Since I use the crockpot so much, standing at the stove is a once in a blue moon situation at our house. They stirred those lentils like it was nobody’s business. In turn, they ate every bite of their creations. When I made the tacos, I steamed some rice to have as a side. We ended up with lots of leftovers- rice and lentil mixture. So, I mixed them together and popped them in the freezer. You can also check out all of my easy recipes for more dinner ideas that are perfect for busy moms. 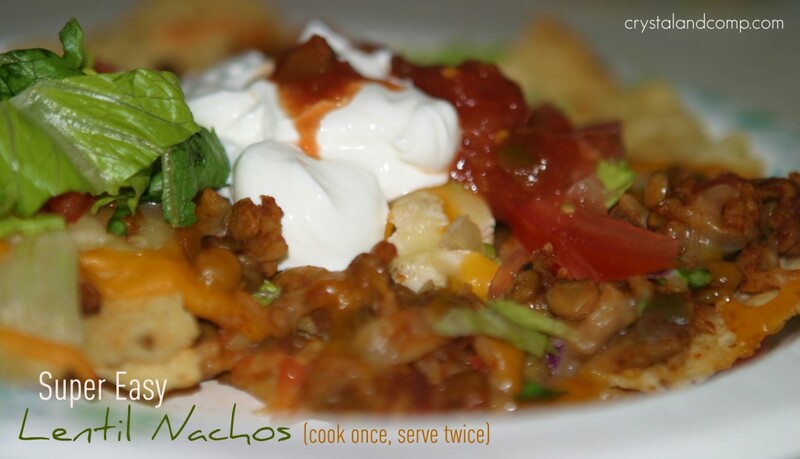 The next week, we had Lentil Nachos and cleared out veggies from the fridge and utilized as many leftovers as possible. 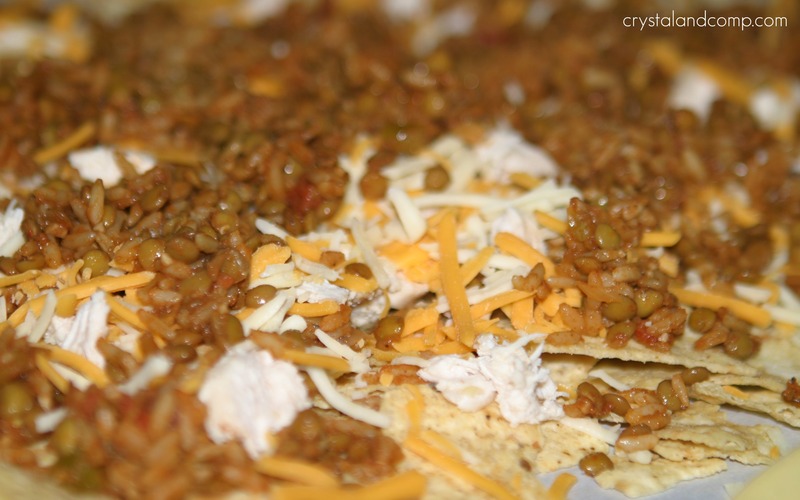 I had a few chicken breasts hanging out in the fridge as well, so I diced them up and used them on the nachos too. Omit the chicken and you can certainly keep this vegetarian if you choose. Utilizing leftovers is an excellent way to cook once and serve twice, but reinventing so leftovers are not boring. A busy mom’s dream! On a cookie sheet (I cover mine in parchment paper to make clean-up easy) evenly pile on some tortilla chips. Then, top with the leftover lentil mixture, any leftover meat (if you choose) and the cheese. Pop it in the oven at 350 degrees until the cheese is bubbly. I like to keep mine in there about 20-25 minutes. Once thoroughly heated, pull it out of the oven and add your veggies. I chopped up leftover bagged salad and tossed on some tomatoes. Top with sour cream, guacamole or hot sauce. Perfect for a busy school night! How easy is that?Perfect for a busy week night! View all of my easy recipes for more dinner inspiration. This recipe is an excellent way to utilize leftovers. Is it time to clean-out the fridge? Let's make nachos! Once thoroughly heated, pull it out of the oven and add your veggies. I chopped up leftover bagged salad and tossed on some tomatoes. 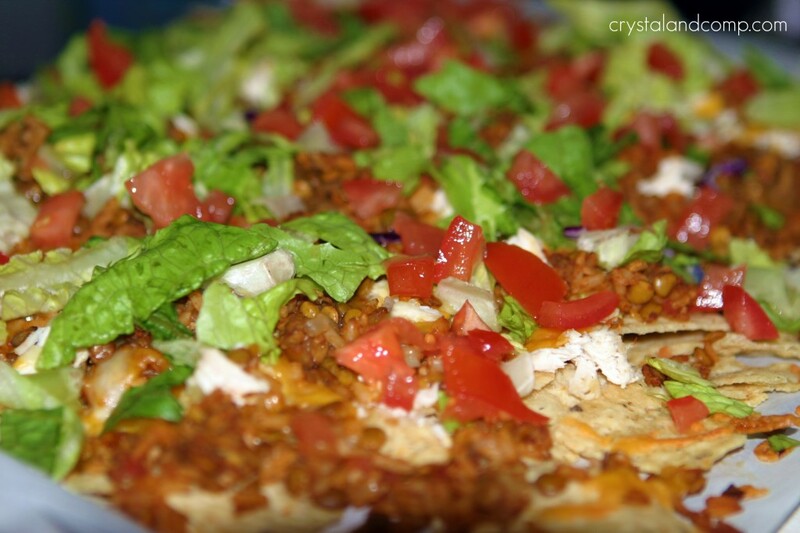 Plate the nachos up and top with sour cream, guacamole or hot sauce. I love this idea! It’s good to know the lentils freeze well. We usually eat it all up, but my daughter would love to have some in the freezer she could eat. Tiffany recently posted..8 Easy Recipes from Crystal & Co. They did freeze very well and I just used a gallon ziplock bag. Thanks for the recipe inspiration! We are excited to find more lentil recipes. Ha, I just posted sweet potato nachos with leftovers too. SUCH a great way to use up leftovers! Those look really yummy. Hmm… I wonder if my husband would go for lentil tacos. I think they sound delicious! Shockingly, no one asked ‘where’s the beef?’. Everyone just happily ate them.